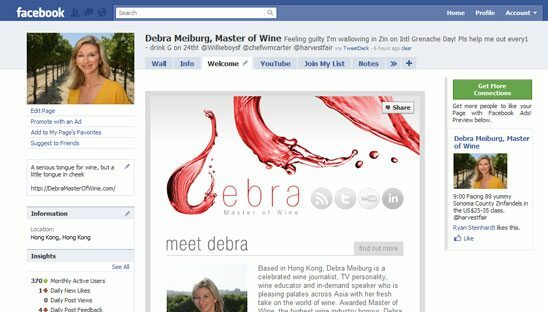 Awarded Master of Wine, the highest wine industry honour, Debra has a serious tongue for wine, but her approach is a little tongue in cheek. Through her numerous wine-related pursuits, she is taking the everyday wine lover beyond the bottle to discover the intricacies of their own taste buds and thoroughly enjoy the pleasures of wine. This is our 1st Custom FBML application that we have designed for a facebook fan page. To learn more on what a “Custom Facebook FBML Application” is, check out method #2 on this tutorial. This facebook tab is probably our most advanced page now, with all sorts of blog feeds inserted. Be on the look out on our tutorial showing how to insert a blog feed and even a twitter feeds into a fan page.